A catchy ragtime piece from 1909, the Yankiana Rag, by Edison's American Symphony Orchestra. 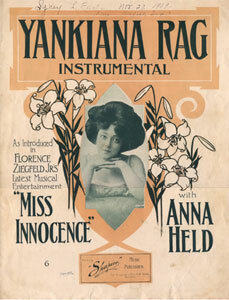 This ragtime number, written in 1908, was a musical highlight and featured in the relatively short five-month New York run of "Miss Innocence". In fact, the show closed in May just as Edison prepared to release this recording! (courtesy of Colin Cochrane's Halcyon Days Music). This composition is featured in Anna Held's musical production, "Miss Innocence." It cannot fail to please all lovers of light musical compositions when rendered by orchestra. Composer, Melville J. Gideon; publisher, Shapiro, New York.